Kuala Lumpur, October 1st-2nd, 2018. 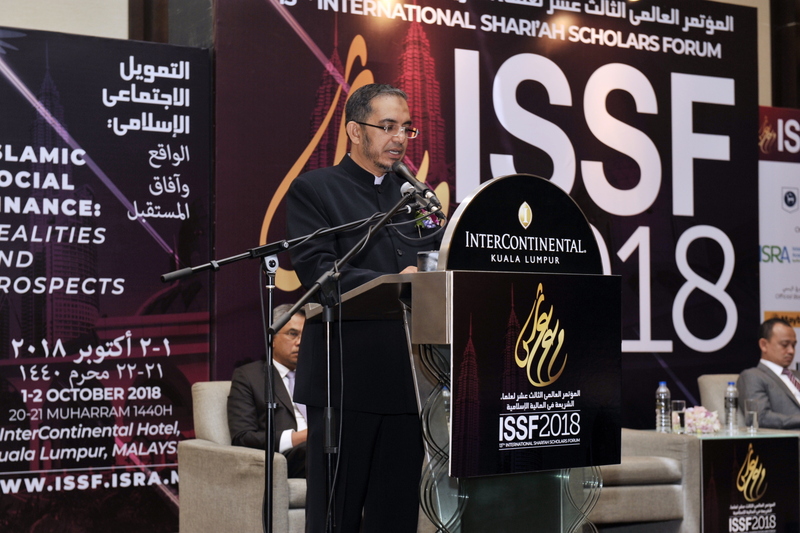 The International Shariah Research Academy for Islamic Finance (ISRA) jointly organised its thirteen annual International Shariah Scholars Forum (ISSF 2018) with the Islamic Research and Training Institute (IRTI) of the Islamic Development Bank in Jeddah. The Forum was held at the InterContinental Hotel, Kuala Lumpur, Malaysia. The main theme of ISSF 2018 was “Islamic Social Finance: Realities and Prospects”. The forum was attended by numerous world-renowned Shariah scholars, Muslim economists, senior industry practitioners and academicians who shared their views and experiences regarding the theme. This year involved three sessions dedicated for English presentations and discussion and one or two mixed Arabic and English sessions to accommodate the participation of English speakers. This year’s ISSF was officiated by Yang Berhormat Dr. Maszlee Malik, Minister of Education, Malaysia, whilst the keynote speech was presented by his Excellency Sheikh Ebrahim bin Khalifa Al-Khalifa, Chairman of AAOIFI Board of Trustees. The closing ceremony of the 13th ISSF was graced by Yang Berhormat Dato’ Dr. Mujahid Yusof, Minister in the Prime Minister’s Department for Religious Matters. The two-day forum commenced with recitation of some verses from the Quran, followed by welcoming remarks by Prof Dr Mohamad Akram Laldin representing ISRA and IRTI. The first keynote speech for the first day, entitled “Valued-based intermediation from a maqasid perspective”, was delivered by H.E. Shaikh Ebrahim Bin Khalifa Al-Khalifa. It highlighted the need for Islamic financial institutions to champion valued-based intermediation in line with the spirit of Shariah. This was followed by the opening speech delivered by YB Dr Maszlee Malik, the Minister of Education Malaysia. The opening ceremony also featured the launch of ISRA’s Islamic Economics textbook, the launch of a new version of ISRA’s Islamic finance knowledge repository known as I-FIKR, and ISRA’s 10-year anniversary video presentation. The forum continued with the first session under the theme “Maqasid framework for socially responsible financing and value-based intermediation”. The second session, which was in English, discussed valued-based intermediation, its scope and the means to actualize it in Islamic finance. In the afternoon, Dr Hatim El Tahir briefly presented the ISRA & Deloitte Sukuk report. The third session discussed an appraisal of Islamic social financing projects in light of the environmental, social and governance (ESG) and socially responsible investment (SRI) framework. Meanwhile, the fourth session examined various means of enhancing Islamic social financing products within the constraint of realities on the ground and innovation challenges. The fifth and final session of the first day examined the legal and regulatory framework for Islamic social finance by highlighting pertinent issues and anticipating solutions. The second day of the forum started with the presentation of the second keynote address by Mr Nasser Hideur, Director General of Salaam Bank Algeria on Islamic social financing instruments: concepts and principles. This was followed by the sixth session in which the discussion centered on various means, instruments and schemes to harmonize the goals of Islamic social finance and the United Nations’ sustainable development goals (SDGs). The seventh session discussed the integration between commercial financing and Islamic social financing instruments, highlighting methods and steps to build a sustainable ecosystem. Prior to the eighth session, there was a short presentation on alternative Financing Modes for Higher Learning Institutions in Malaysia-Socially Responsible Investment (SRI) Sukuk, Social Impact Bonds (SIB), and Public-Private Partnership (PPP), which highlighted the outcomes of a research project commissioned to ISRA by the Ministry of Higher Education (MOHE). Following the short presentation, the eighth session dealt with the integration and development of zakah collection and distribution through Islamic banks. It also involved discussion on perennial issues of zakah calculation in Islamic financial institutions. The ninth session addressed various means and innovations to ensure the integration and development of waqf model through the Islamic finance industry. The final session was an open dialogue with the scholars. In this session, the panellists further addressed some Shariah concerns pertaining to integration and diversity in Islamic social finance operations. At the end, they proposed solutions and innovative ideas to promote the Islamic finance industry. Prior to the closing remarks, Assoc. Prof. Dr Said Bouheraoua, Director of the Research Development and Innovation Department at ISRA, read out the resolutions of this year’s forum. YB Dato’ Dr Mujahid Yusof delivered the closing remarks and expressed thanks to all the scholars, industry players and academicians who contributed to the success of the forum.